Pashu Palan Mela of Guru Angad Dev Veterinary & Animal Sciences University, Ludhiana concluded with message to develop livestock farming as an impressive and effective option of diversification by keeping in mind crop residue management in an environment friendly manner. Mela attracted a huge gathering with a thought to develop livestock professions on modern terms. 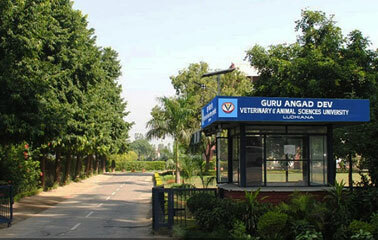 Whereas Guru Angad Dev Veterinary and Animal Sciences University is contributing in the field of education and research it is also promoting livestock professions with its extension activities. To develop livestock professions, University is extending its services, support, know how & training to every economic category. Besides delivering services to commercial farmers it is also disseminating all the techniques to medium and lower category of livestock community to provide equal opportunities to farmers. It helps them to earn benefits with their limited resources. These views were expressed by Dr. A.S. Nanda Vice Chancellor GADVASU on the concluding day of the mela. Dr. Harish Kumar Verma, Director of Extension Education informed that some of our departments are providing services for rearing livestock where as others are in the field of value addition of livestock products. These professions help them to earn a handsome income. Women can do these professions comfortably with their household responsibilities. He revealed that ornamentals fish, Aquarium making, flavoured Milk & Lassi, Cheese, Meat Pickle, Meat Kofta, Meat patties, Meat balls and a number of fish delicacies come in these professions. He said that Young entrepreneur can earn good returns in goat & pig farming. In this mela college of dairy science and technology displayed about 30 value added products of milk. Department of Livestock Products and Technology displayed about 35 value added products of different types of meat and eggs. College of fisheries displayed 10 value added products of fish meat. There was great response to these stalls. Farmers were highly enthusiastic to be trained for the development of milk and meat products and the departments have assured to provide them literature and training on their requirement. Dr. Verma revealed that a large number of farmers visited the stalls and showed keen interest in the measures to be adopted for the control of parasitic diseases of livestock. The department of Animal Nutrition has developed a number of nutritional technologies for the dairy animals of the state, which were displayed in the Pashu Palan Mela. Good quality mineral mixture and uromin lick prepared in GADVASU was sold at economical price. Department of clinical Veterinary Medicine addressed the commonly prevalent diseases of the dairy animals of Punjab which are mastitis, mineral disorders, foot lameness and fore-stomach disorders. The college of fisheries displayed different varieties of fish like carp fish, cat fish and ornamental fishes. A number of farmers said that Pashu Palan Mela is a good rendezvous to interact with experts of different animal husbandry departments of state, scientists of university, technical experts of different companies and financial institutions collectively. Farmers purchased University publications entitled Dairy Farming, Package of Practices, University Diary, different types of calendars like calf calendar and animal diet calendar for brushing up their knowledge. Farmers registered their names for monthly magazine. The Judgement committee of university adjudged all the stalls and in industry category declared Mankind Pharma first, Intas Pharmaceuticals and Provalis Healthcare Ltd. both second, Agro Pharma nutrition, Himalaya Drug and Aggarwal Dairy all three declared third. In the university category Department of Veterinary Parasitology adjudged first, Department of Livestock Production Management and School of Animal Biotechnology second, RRTC, Talwara, KVK, Mohali and Animal Diseases Research Centre third. The Pashu Palan Mela concluded with a new optimism to give a clean environment for our present and future generations.